The famous sax quartet Itchy Fingers in 3/4 of the original cast with well known and new material. 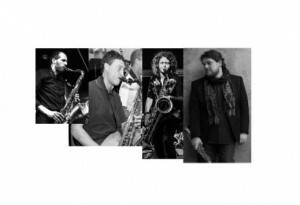 Itchy Fingers was founded by Mike Mower in 1985 and enjoyed 12 years touring the world as one of the most influential jazz saxophone quartets of all time, winning numerous international awards and recording four albums on Virgin and ENJA record labels. They achieved an unparalleled reputation for wild and virtuoso ensemble playing and inventive individual improvised solos.…And now, after an 18 year break, they’re back! “Itchy Fingers (Reloaded)” will walk on stage tonight in a new improved version, incorporating the old and the new.